The Two Block Platform is a versatile object if used with a bit of imagination. In its original form in TR4 it was limited to variable ascent and a single-click descent (OCB=0). Example OCBs were detected in the original TR4 levels to set height and speed of ascent. Then the OCB formula was determined (see below). This means that you can set exactly the ascent height and speed of travel for the platform. The additional power of TRep adds even more dimension to the object, with full descent capability and control of the height, speed of depression and speed of repression. In the examples that follow I have listed as many generalised combinations as I can think of, to show the outcome of each setup. Although the list is extensive, there may be others that I haven't thought of right now. Hopefully there are enough examples that will inspire you to think of your own unique setup for your game level. - TBP = Two Block Platform. - Suitable OCB formula - use TBP OCB formula to calculate how high and how fast you want to raise platform. 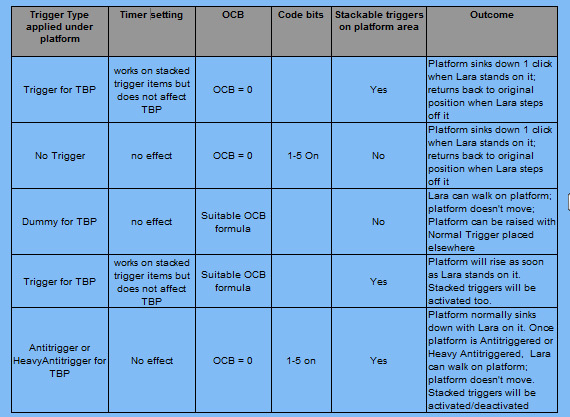 In original TRLE OCB 0 + codebits 1-5 On, with no trigger, made platform depress 1 click only when stepped on and return back up when Lara steps off it. The platform could not be lowered continuously. - TBP= Two Block Platform. - TBP will transport Rollballs, Pushable Objects (without special climbable OCBs), Enemies and Torch. - In the Heavy trigger examples that follow, a Pushable Object can be used in many of the situations to act as the Heavy trigger. - With all OCB=0 descending platform configurations, the default descent/ascent speed is constant. To alter depression and repression speed you must use TRep Object (Trap) Customizer section. In this section you can also set the depression distance. For suitable height values use multiples of 256 (= I click). e.g. 4 clicks descent would be 1024. (Thanks to Sapper for info about this and Aliases.txt). 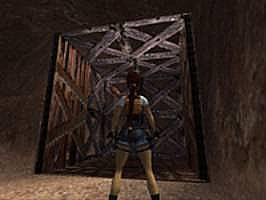 - In the above example the platform lowers 2 clicks quite quickly when Lara steps on it and ascends at half the descent speed when Lara steps off the platform. - In all the following examples that include Timed switches you must have the depression distance and speed set to take longer than the timed switch duration. For all examples where the platform sinks down, The depression distance will be determined by the TBP parameter settings you use in Trep and/or eSSe script. - One Block Platform Slot can also be enabled in Trep and act as a second Platform setup. In Coyote Creek's Working Mine level, I used the TwoBlock Platform to create the old mine shaft elevator. The lift shaft was the same 2x2 area as the platform. 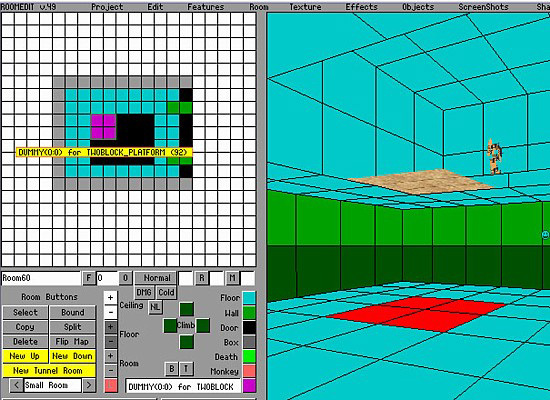 The Lift object was a single mesh for the Two Block Platform with two Door objects at each entry/exit point. The sides and ceiling of the cage were slightly smaller than the room dimensions and had no collision, but were there for the visual illusion. You can't tell because the shaft is the same size as the moving object. The hanging starter rope for the lift was an additional dummy component of the elevator mesh (as it needed to move with the elevator). An invisible Pulley object was used as a Switch to give the illusion that the rope was pulled to start the elevator's ascent and to close the elevator doors. The exit doors were triggered by a delayed timer trigger set to open when the lift had arrived at the top of the shaft.